Hundreds of cyclists gathered on Worthing seafront for Guild Care’s biggest Pedal Along the Prom yet. 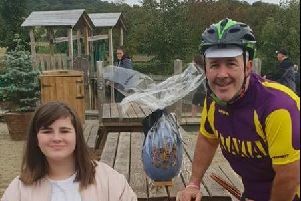 The sponsored cycle ride on Sunday saw individuals, families, couples and friends unite, and so far, more than £3,000 has been raised for the Worthing-based charity’s work with children and adults in need. More than 200 riders took part, some following the five-mile route and some on the ten-mile route, all starting and finishing at George V Avenue. 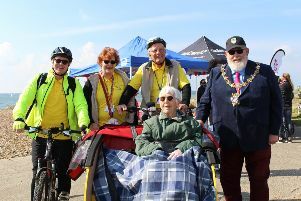 Worthing mayor Paul Baker started the event and mayoress Sandra Baker completed the five-mile route. Despite the chilly wind, the riders enjoyed a leisurely bike ride along the seafront and were grateful for the hot drinks and snacks provided at the end. The first ten-mile cyclists to reach finish line were Nick Williams and Nathan Edwards, who are both in training for the London to Brighton Bike Ride in June. They made it back in just over 40 minutes. The youngest competitors to complete the ten-mile route was Leo Harris, five, and sister Delilah, seven, with mum Kate Harris. Father and son Simon Day, 39 and Aaron, eight, from Littlehampton took part in the ten-mile challenge together. Annalise Garner took part with her children Grace, six, and George, nine. George even helped raise money for the charity through his school friends. One family had three generations taking part on the ten-mile route, mum Katie Cripps, her children Tilly, eight, and Eddie, six, and their grandparents Viv and Peter. The event, which was the biggest Pedal Along the Prom so far, included some more unconventional means of transport. Friends John and Chris travelled from Bournemouth to take part. The cycling enthusiasts brought their own custom-made bikes, which stand at 7ft tall. Stephen Boult took part on a recumbent-style bike he out of old, scrap bikes. He has suffered from mental health issues over recent years it was the charity Mind that suggested he get involved. It took him three months to build the bike. Juliet Hinton-Smith, events officer, said: “Thank you to everyone who came along and took part in Pedal Along the Prom this year. We had over 200 people signed up, our highest number ever for this event. Sponsorship for Pedal Along The Prom should be collected by Friday, May 17. Don’t miss Guild Care’s biggest fundraising event, Walk for Worthing, on Saturday, June 15, and help the charity to raise £15,000. Visit www.guildcare.org/walk for more information.